The mid-sized Chevy Colorado pickup will be lighter and more fuel efficient than today's full-sized pickups. Now that General Motors has announced Chevrolet will market a mid-sized pickup, the next step is making it appealing to buyers, especially those who prefer full-sized trucks. It may require some tough tactics. Specifically, production of today's Colorado, a slow-selling compact pickup, will end in the 2012 model year, and it will be replaced by a wider and longer mid-sized pickup, GM calls it. Last week GM showed journalists in Detroit the mid-sized Colorado, a very attractive pickup concept. Specifications were not revealed. The next-generation Colorado is a response to proposed CAFE regulations that require an overall light-duty vehicle average of 54.5 mpg by 2025. Under the proposal, cars are required to improve fuel economy by 5 percent annually, while trucks require a 3.5 percent improvement. The final regulations will be announced next year. The 2012 model year regulation calls for an overall mpg standard of 30.1 mpg. The mid-sized Colorado pickup will be lighter and more fuel efficient than today's full-sized pickups, serving as an alternative if fuel prices climb to a level not been seen before. Details were not revealed. The full-sized, two-wheel-drive 2012 Chevrolet Silverado 1500 gets 15 mpg in the city and 21 mpg on the highway, or 17 mpg combined. 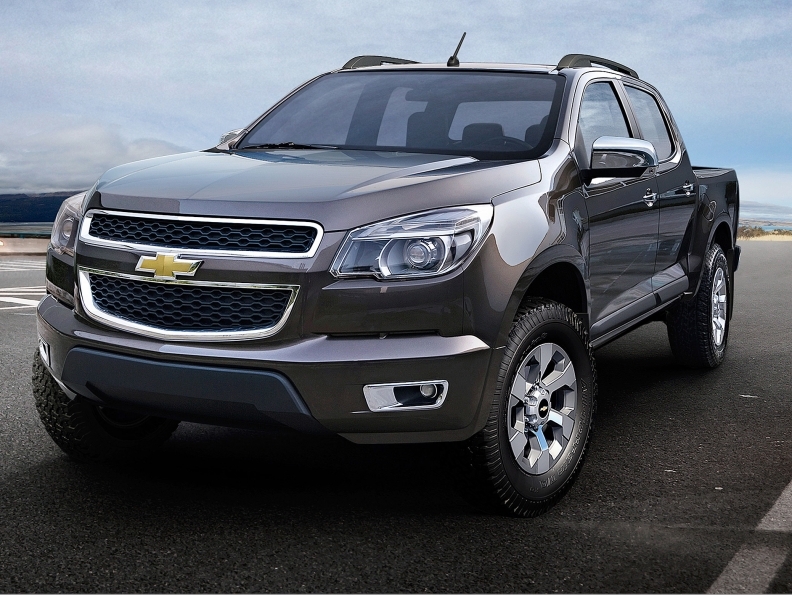 The redesigned Colorado will be aimed at buyers who prefer a pickup but do not need the capability a full-sized truck. Early this year I interviewed Jamie Hresko, who at the time was vice president of GM's global powertrain engineering. Hresko suggested mid-sized pickups were inevitable for the industry. Automakers would need mid-sized pickups to meet stiffer CAFE regulations. A business plan based on unlimited sales of full-sized pickups would no longer be viable under stiffer CAFE regulations. Since the interview, Hresko has retired from GM. Of course, now we know a mid-sized pickup is on the way for the Chevrolet brand. Presumably, also for GMC. Ford, meanwhile, has no plans to sell a mid-sized pickup here. Chrysler has gone back and forth on the subject. Hresko, in the interview earlier this year, suggested mid-sized pickups likely would be a tough sell. After all, bigger is better in the pickup world. But for an automaker to meet tougher CAFE regulations, some of these buyers would need to shift to a mid-sized pickup. How? Make full-sized trucks less attractive to some buyers. One possibility: Raise the price of full-sized pickups. The intent is to push buyers not requiring a full-sized pickup for their job into the lower-priced and more fuel efficient alternative, a mid-sized truck. Another possibility is eliminating the wide range of luxury options available on full-sized trucks, such as leather seats and high-end navigation systems, limiting the "sky's the limit" luxury features to mid-sized models. The full-sized pickups arriving after 2020 might be marketed much as pickups were in the 1950s and 1960s: basic workhorses for tradesman, farmers, ranchers, construction workers and government employees. Mid-sized pickups are coming, at least at GM. The question is, will the market accept them?